Preparing the Seder plate items can seem overwhelming, but it needn’t be. Although there are six or seven different components, none of them are particularly complex. Here I’ll explain what each element represents, how it’s prepared and when it’s used. For more detailed information, check out the Seder preparation section on our Passover site. 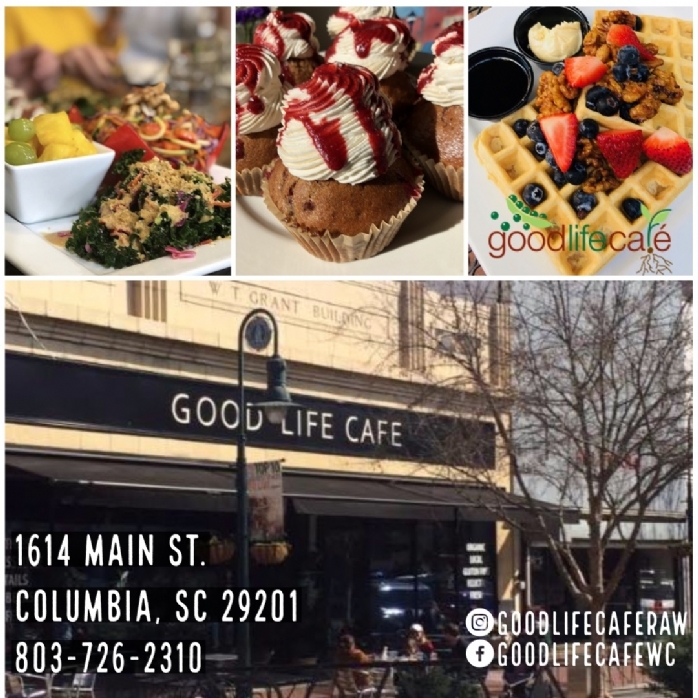 Please note: Some of the items used may vary depending on your community and family. I am going according to the Chabad custom. The shank bone represents the paschal sacrifice brought in Temple times. For this we use a chicken neck, roasted on the stovetop. Hold the chicken neck over a burner with a pair of tongs, until blackened on both sides. Prepare one for each Seder plate. The shank bone is not eaten, and the same one can be used for both nights. The hard-boiled egg represents the holiday offering brought in Temple times. Prepare one egg per Seder plate. You may also wish to prepare one for anyone else at the table who is not using a Seder plate. The egg is traditionally dipped in salt water and eaten at the beginning of the meal. 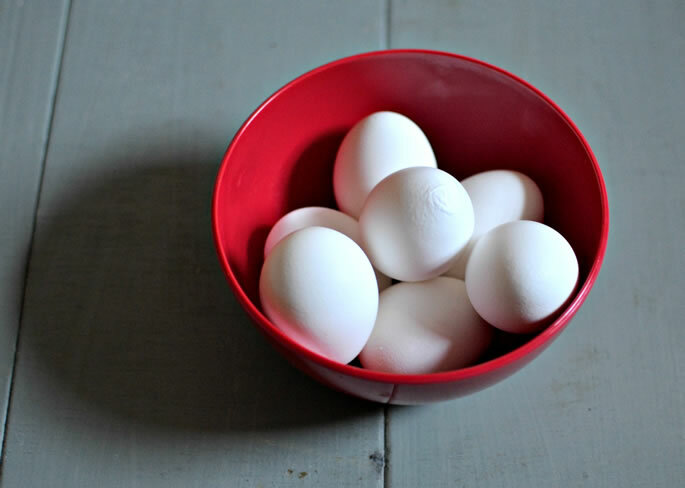 To prepare: Place the eggs in a pot and cover with cold water. Cover the pot and bring to a boil. When the water reaches a rolling boil, turn the fire off and leave the eggs in the covered pot for about 12 minutes. For easier peeling, run the eggs under cold water. The bitter herbs remind us of the bitter slavery and exile in Egypt. 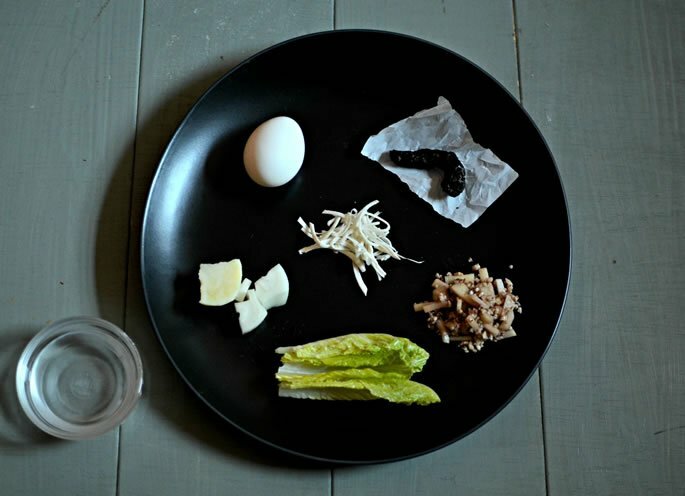 We use freshly grated horseradish root wrapped in romaine lettuce. 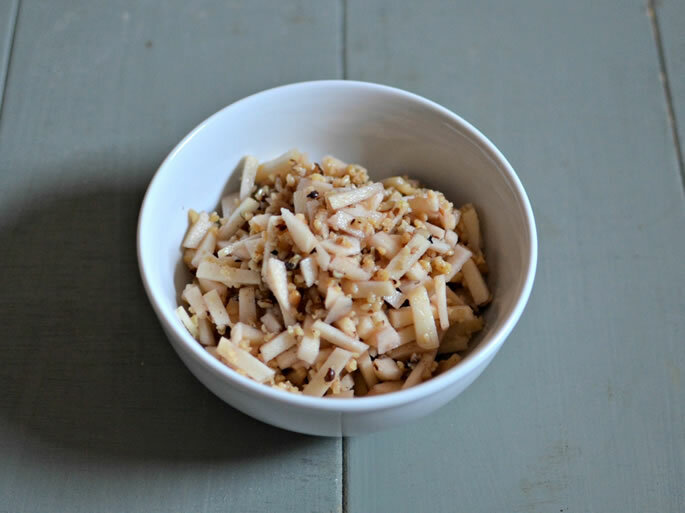 To prepare the horseradish, peel and grate the horseradish root. You can use a hand grater or a food processor. Store in a glass jar for maximum freshness. The lettuce symbolizes the bitter enslavement of our fathers in Egypt. The leaves of romaine lettuce are not bitter, but the stem, when left to grow in the ground, turns hard and bitter. Likewise, when we were enslaved in Egypt, at first the deceitful approach of Pharaoh was soft and sensible, and the work was done voluntarily and even for pay. Gradually, it evolved into forced and cruel labor. 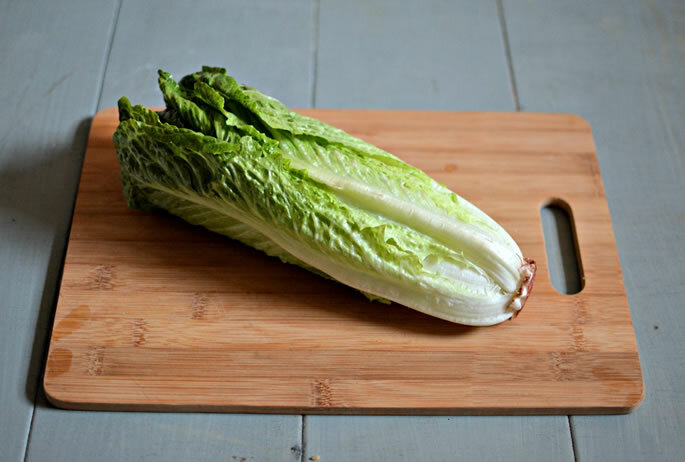 To prepare the lettuce, wash it well and check for bugs. I find the easiest way is to cut off the stem and place the leaves in a big bowl of water. Remove and check each leaf, and pat dry with a paper towel. The lettuce and bitter herbs are used twice. After we finish the maggid portion of the Seder, when we tell most of the story of the Exodus, we wash hands and eat the matzah. Then we eat the maror (the grated horseradish wrapped in a couple of lettuce leaves), and after that, we eat the sandwich (another dose of horseradish and romaine, this time sandwiched between matzah). Charoset reminds us of the bricks and mortar the Jewish people were forced to make while enslaved in Egypt. We use it as a type of relish, into which the maror is dipped (and then shaken off). 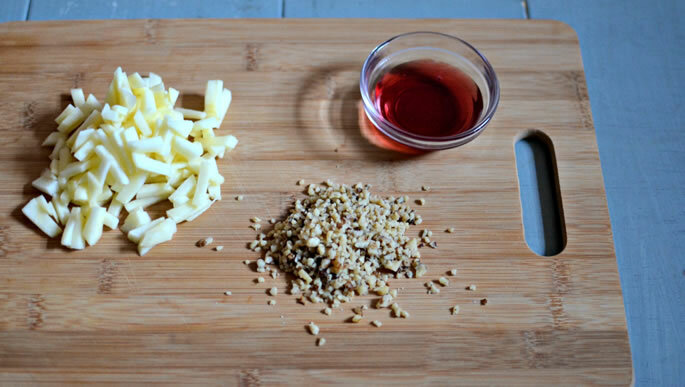 For a basic charoset, mix together 1 finely diced apple, 1 finely diced pear, 1 cup ground walnuts and ½ cup red wine. Check out more variations here. The vegetable alludes to the backbreaking work the Jews did in Egypt. The letters of the Hebrew word karpas can be rearranged to spell perech samech. Perech means backbreaking labor, and samech numerically alludes to the number of Jews enslaved in Egypt. The vegetable is dipped in salt water and eaten at the beginning of the Seder, after saying kiddush and washing hands. 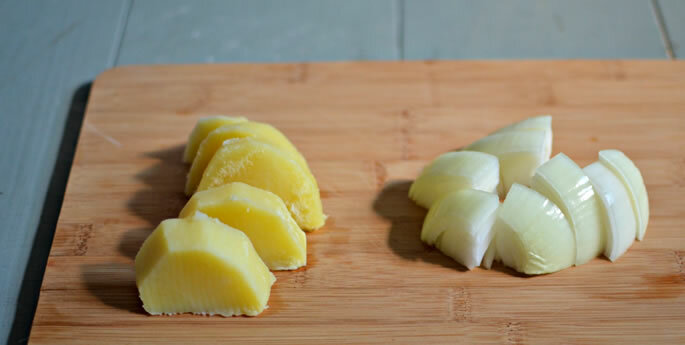 The Chabad custom is to use a piece of cooked potato or a piece of raw onion, but many others use parsley, radish or celery. Peel and cut a potato and place in a small pot with enough water to cover. Bring to a boil and cook until the potato is fork tender. For the onion, just peel and cut into chunks. Prepare enough karpas for each person at the Seder. The salt water represents the bitter tears our ancestors shed while enslaved for so many years. It is placed in a small bowl next to the Seder plate, and both the karpas (vegetable) and the egg are dipped into it. 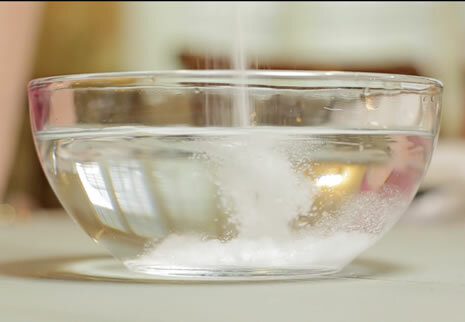 Make the salt water by mixing 1–2 tablespoons of salt into 2 cups water. And that’s it . . . you’re done! Here are some tips to help your Seder plate preparation go quickly and easily. Make a list so you can cross off each item as it’s done. If your kitchen is Passover-ready in advance, get a couple of items ready early. The shank bone can be frozen after it’s roasted, for example. And if you put the lettuce in a Ziploc bag with all of the air squeezed out, it stays fresh and crunchy for a good week. Eggs can be boiled 1–2 days before, and the salt water can be prepared at any time. It also literally takes about one minute. Multitask. 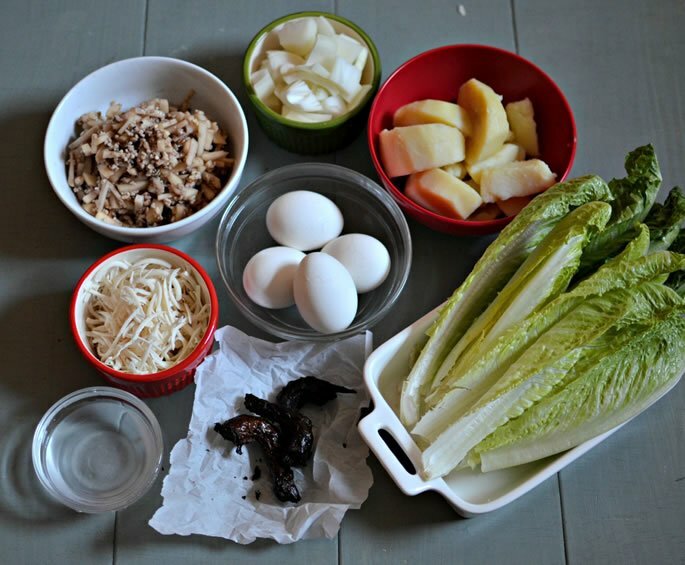 Keep in mind that the cooking of the eggs and potato is “passive time.” You can use this time to prepare other elements. Grate the horseradish in a separate room, or even outside. When it is very fresh and potent, it can make everyone’s eyes sting, just like onions. When grated, that carries through the air and is particularly strong. 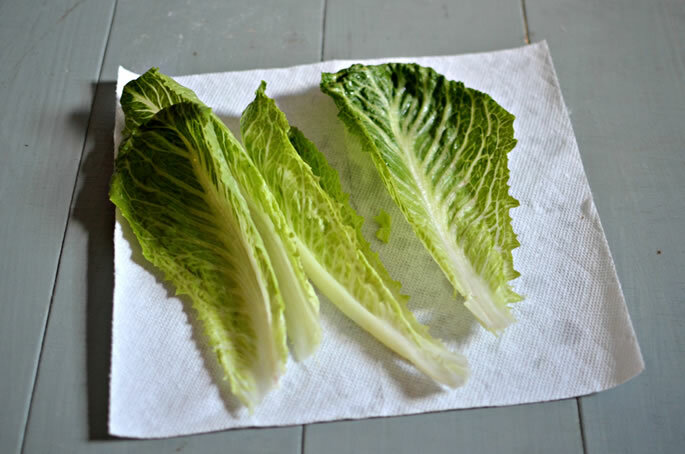 The most time-consuming task is probably the washing, checking and drying of the lettuce. If you have kids around, this is a good job for them. The amount of time it takes will largely depend on how many people you are preparing for. If you have a big crowd, delegate! Ask people to chip in and hand out specific jobs. I would like to receive news and updates from Chabad of South Carolina by email. I have a question this time, please. Is it acceptable (Kosher) to combine ground beef with ground chicken or turkey? (Actually, I haven't been able to find Kosher turkey at the two butchers where I go). I used to combine 1 part ground beef and 2 - 3 parts ground chicken or turkey and it still tasted completely beefy! I am sure i saved lots of fat calories that way. I would also finely mince the spiciest onion i could find into that mixture with my other normal seasonings. Sometimes I would make a batch as breakfast sausage and spike the mix with fennel seed peperoncino. Anyway, is mixing beef and bird Kosher? Learning Seder and it's Meaning I'm 65 today, as matter of fact, was born a Jew. But my father was catholic and requested that my mom raise us that way. I chose when I came of age to be what I was born to be. Yet, in all my years, I have only been a part of one Seder. I was stunned and sat mesmerized through t all. The reason I'm prefacing my point, is nothing was explained, not the why, how, where. This article is amazing and, I will need every bit of it for next year; thank you all so very much! where are u this pesach? From Hunting Eichmann , Jews & Baseball to the "Son of Hamas".